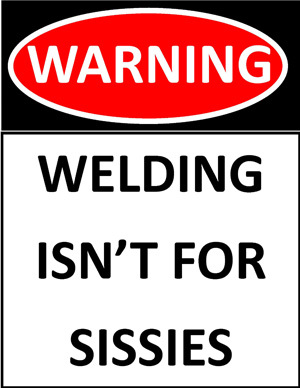 If you’ve read my recent postings you’ve probably read a little about our recent welder woes. My old faithful Miller welder took a beating while I was using it during a blizzard, and now it’s part of the dearly departed. Miller just doesn’t make parts to fix it anymore. So I bought a new Miller Trailblazer, which has the same capability as the old welder (mostly) along with some new tricks. The new technology (and methodology) built into the new welder present a bit of a learning curve, or at least building of some different habits. So far it seems that the only “casualty” to our service offering is that we can’t thaw frozen pipes anymore. Otherwise, I’m pleasantly surprised at the machine’s ability to actually “help” with the welding process. It has circuitry built in that essentially figures out what’s happening at any given moment, and makes minor adjustments to compensate. With me being a person who’s welded from transformer welders and generators my whole life, I tend to fight it a bit when I notice changes happening to the weld arc.I need to step back and relax a bit, so to speak. Also, the machine has settings that can change the penetration of the weld, while keeping amperage constant. This is something I’ll just have to learn to apply in the field as time goes on. Probably the greatest thing so far is that it makes the closest thing to a shop grade TIG weld that I’ve seen. My first aluminum weld with it left me saying “where have you been all these years!” I’m very happy with the results! I’m guessing quite a bit of this is jibberish to most of you, so let’s just say our recent “forced upgrade” in technology has brought a whole new world of possibilities to Amerivet Services, with only a minor change in our old service offering. For those of you who need pipes thawed, I’m sorry to say we won’t be able to offer that service until I find an old welder that I can put on a trailer and leave behind the barn for occasional use. For everybody else, let’s get with it and build your future!